Whether you're teaching children about marsupials, chances are you'll discuss opossums, also called possums. These small marsupials are interesting animals for children to learn about because of their ability to "play possum," their unusual pouches and their unique appearance. 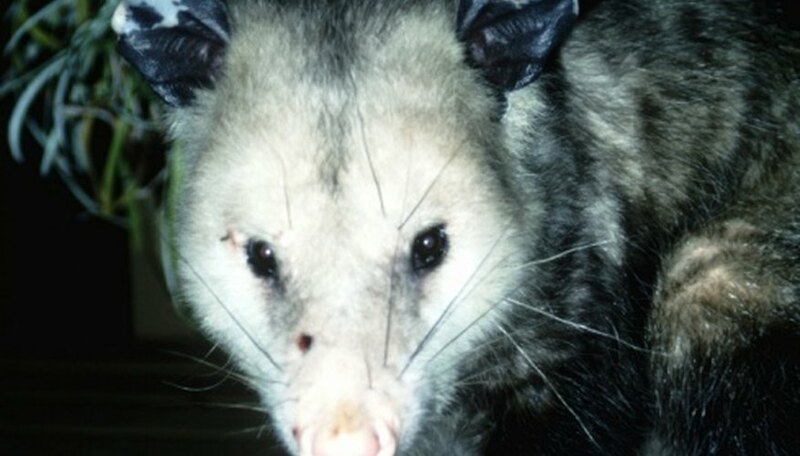 As an extension activity, have kids make possum crafts to increase their understanding of these animals. Create possum masks from paper plates. Provide children with paper plates with eye holes already cut out of them. Instruct children to color the back side of the plates with gray crayons. Provide them with gray construction paper and instruct them to roll the paper into a cone shape. Use staples to secure the cone shape, and glue or tape it to the center of the plate, creating a possum's nose. Cut lengths of black yarn, and glue them to the paper plate on either side of the nose, creating whiskers for the animal. Instruct children to cut two triangles from gray construction paper, and glue them to the top of the paper plate. To complete the craft, glue a craft stick to the bottom of the paper plate. Children can hold their masks over their faces and pretend they are possums. Have children create pouches for possums. Print out pictures of possums onto card stock. Distribute the pictures to children and instruct them to color and cut out the pictures of the animals. Offer children brown paper lunch bags and instruct them to cut the bags in half -- discard the top half of the bags and keep the bottom portions. Have children color the bags the same color they used for the pictures of the animals. Cover the back side of the bags with glue and press them onto the stomachs of the possums -- the bag should still be able to open. Once the glue dries, the possums will have pouches. Brown paper lunch bags are used to create possum puppets with this craft. Offer children lunch bags and instruct them to lay the bags upside down on a flat surface with the flap pointing out. Have kids fold the ends of the flaps up and under the flap, creating a triangle -- this will serve as the possum's nose. Instruct children to color the bags gray and have them cut gray triangles from construction paper and glue them to the top of the bags. For whiskers, cut black pipe cleaners in half and glue them to either side of the nose. Glue two googly eyes onto the flap of the bag, just above the nose. Cut out a long rectangle from gray construction paper and glue it to the bottom of the opposite side of the bag, creating a tail. Use paper plates to create a possum with a pouch. Distribute paper plates to children and instruct them to fold the plates in half. Staple around the rim of the paper plate, securing the sides together, but leave the top half of the plate open. Print out pictures of possums and instruct children to cut out the heads of the pictures. Have them color the heads and the paper plates, and then glue the heads to the back of the arch of the plates so that the head is facing out. Have children draw legs and arms for the animals, and cut them out and glue them to the sides of the paper plates.